I love Disney World, that is clear. But like any love there are some things about Disney that I cannot stand. These things fall into the category of been there, done that, never doing it again! Certainly, these things are my opinion only and if you have never been to Disney you should test things out yourself…whats that old saying? Oh yeah, one mans trash is anothers treasure. 1. Stitch’s Great Espcape- This “attraction” is best described in one word…sucky. Yup I went there. If you are a normal person you will despise the fact that you are burped on by a crude but furry alien. If you are a clostraphobic this ride is probably what your nightmares are made out of. You are ushered into a room where you will sit down in a semi comfortable seat. You think for a moment…ahhh…I am off my feet, it is cool and the lights are low! I can relax. That moment is brief. In the matter of seconds you are strapped to your seat by an extremely confining over head constraint system. You can barely move. The lights go off. Then you have to endure several minutes of pure torture. You are spat on, burped on, and possibly tickled. It is absolutely horrible, not entertaining at all, and a complete waste o- f time. 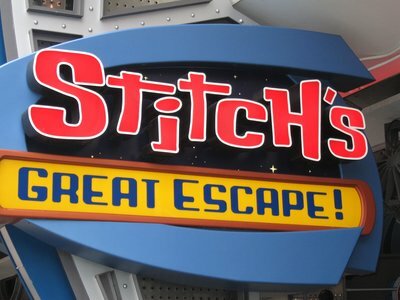 I promised after the first time I experienced Stitch I would never ride again, however on a recent trip with a friend she did not believe me that it could be that bad. I went on again and she agreed…worst ride ever! 2. Mission: Space- I know this is actually a popular attraction and real astronauts have said how realistic and wonderful this ride is. I am here to 100 percent disagree with this. Well, I guess I don’t truly know about the realistic part having never been to space, but this ride is not wonderful. You are harnessed in and pushed back against your seat as your shuttle launches. Then you are sent into space where you will become more dizzy than you have ever been before. This is the only attraction on Disney property that provides you with barf bags…there is a reason for this. Every time I disembark from this ride I feel like my entire day is ruined. I am dizzy, nauseous and now I have to step out into the bright sun and 90 degree heat. Not my idea of a good time. Do yourself a favor, if you have to ride this try the green team version first. This has all the cool effects without the horrible spinning. 3.Primeval Whirl-This little coaster is located in Dinoland at Animal Kingdom. I vote this ride most likely to give you cronic back and neck pain. You can find coasters like this at almost every county fair in the USA. You are spun and jerked from side to side as the crud car makes its way down the steel track. The stops are abrupt and the turns will give you whip lash. Its not my idea of a good time and I can skip this ride easily! In fact, I can generally skip dinoland as a whole. 4. The Sum of All Thrills- This attraction, located in Epcot, lets you become and imagineer for a brief moment in time as you create and then ride your own simulated roller coaster. Actually, the design part is pretty cool. You learn to use math and science to help you build a fantastic thrill ride. Riding your design not so cool. You are put in a simulator and harnessed into a seat. You peer at your attraction on a screen directly in front of you. This ride makes you super dizzy! Even if you do not put inversions on your coaster you come out feeling like a frat boy on a Friday night….ready to puke! I wonder if they have the option to just design a coaster and not ride? I also have to add since the simulators only hold two guests at time and there are only three simulators, lines are long so why waste time! 5. Swiss Family Tree House-Located in the Magic Kingdom, this attraction is a must skip for me. In all fairness this has nothing to do with the elaborate attention to detail or the cool story behind the tree house and everything to do with the fact that I am too lazy to do this more than once. There are so many stairs! You must be able to walk up and down those steps without assistance to participate in this method of torture attraction. Honestly, If I wanted to pay to sweat my brains out going up and down steps I would just use the stair master at they gym. Cute idea with the tree house and all, but no thanks. Sincerely, I’ll take the elevator. This entry was posted in My thoughts, Top Five and tagged Dinoland, Mission: Spaces, Primeval Whirl, Stitches Great Escape, Sum of all Thrills, Swiss Family Tree House. Bookmark the permalink. ← NEWS FLASH!!! HURRICANE SANDY BATTERS THE DISNEY FANTASY!